Herbsmith Rx Gastrodia Settle Seizures increases the firing threshold of neurons within the brain, reducing the amount and severity of seizures. Herbsmith Gastrodia Settle Seizures is an ancient herbal blend used to exhaust internal wind. Seizures are defined as uncontrolled massive random firings of neurons within the brain. In western veterinary medicine, the cause is often unknown. Chinese veterinary medicine considers seizures to be a severe version of internal wind. 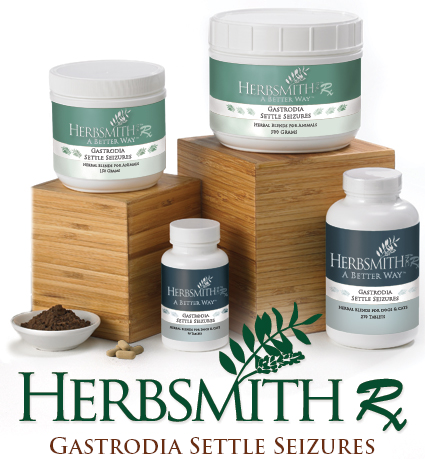 Herbsmith Gastrodia Settle Seizures is an ancient herbal blend used to exhaust internal wind and settle seizures. In scientific studies gastrodia, the main herb in Herbsmith Gastrodia Settle Seizures, has been shown to increase the firing threshold of neurons. By raising the firing threshold, this formula decreases the random uncontrolled firing of neurons within the brain, leading to fewer and less severe seizures. Chinese medical theory views the animal body as similar to nature. A seizure is considered to be an internal tornado, the most extreme version of excessive wind. In nature a tornado often occurs when a cold air front meets a hot air front or vice versa. In the animal body, seizures are often seen after an experience that causes extreme heat, such as anesthesia, vaccines, toxins or extreme frustration. This heat within the body is considered liver yang rising upward. The herbs in Herbsmith Gastrodia Settle Seizures extinguish wind and calm liver yang.